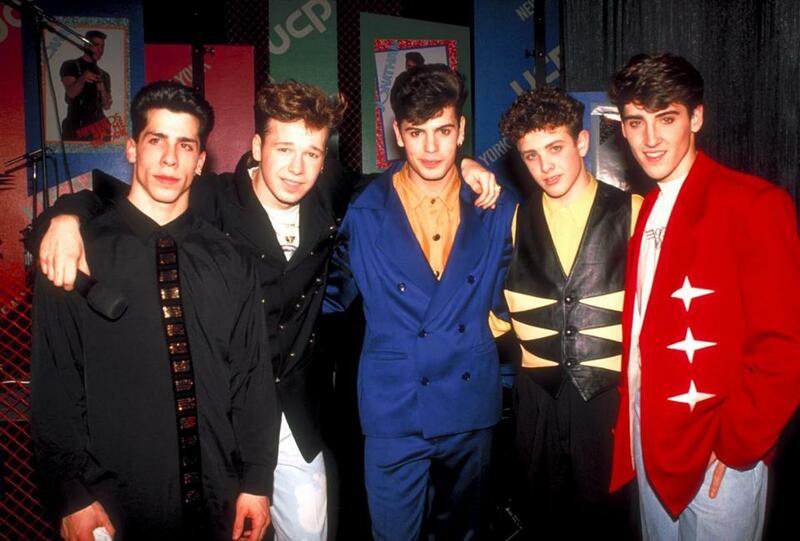 From left: Danny Wood, Donnie Wahlberg, Jordan Knight,Joey McIntyre, and Jonathan Knight at Tampa Stadium to perform at Super Bowl XXV in 1991. Donnie, Danny, Jordan, Jonathan, and Joey. Say those names to women of a certain age and stripe of pop fandom and no last names are necessary. 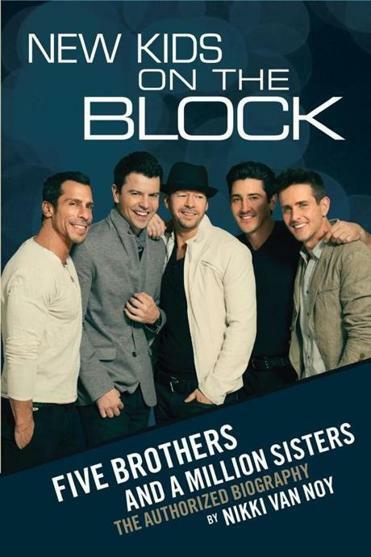 Anyone adjacent to those women in the late 1980s and early 1990s may still be partially hearing impaired by all the screaming they did for the New Kids on the Block — Donnie Wahlberg, Danny Wood, brothers Jordan and Jonathan Knight, and Joey McIntyre. The group was a true pop phenomenon, selling more than 80 million records and everything on which their teen heartthrob faces could be imprinted, from bedsheets to marbles. 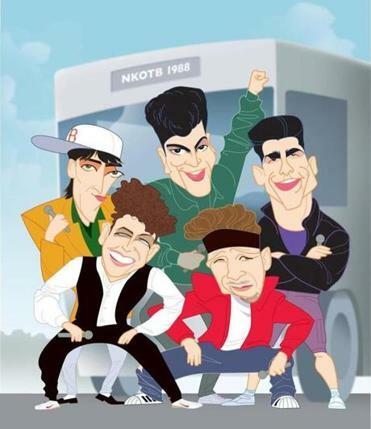 “Five Brothers and a Million Sisters,” the bubble-gum sweet authorized biography by fellow Bostonian and clear superfan Nikki Van Noy, aims to capture what it was like in the eye of the storm for the group, and almost as importantly, what the New Kids on the Block meant and continue to mean to their fans. Both the group and the book have a classic “Behind the Music” trajectory. From the new authorized biography come these scenes from the boy band’s start. It was a time of break dancing, goofing off, and dreaming big. Five scrappy young kids — four from Dorchester, one from Jamaica Plain — come together in 1985 with visions, not of fame so much as doing something they love that keeps them off the streets and might lead to a better life for their blue-collar families. Hard work, some skill, luck, timing, and peppy soul-pop ditties that address the universal “girl” garner worldwide adulation from fans and scorn from some members of the media and the music industry. Changing times and burnout result in a breakup in 1994. Almost 15 years later NKOTB reunites and its successful comeback culminates in a triumphant, cinematically rain-soaked show at Fenway Park. Given that it’s an authorized biography that includes lots of interviews with the guys’ parents, it’s no surprise that this is a pretty squeaky clean tale. They were five young guys out on the road swarmed by fans, but “Five Brothers” would have you believe that they mostly hung out and played ping-pong. What is surprising, and disappointing, is how little reporting Van Noy did with the pivotal early players outside the group itself. Whenever a name is mentioned and an obvious opportunity arises for another perspective — A&R executives, managers, video directors, Tiffany — Van Noy simply moves on. And we hear nary a peep from group coach-songwriter-producer Maurice Starr. Starr may not have been the Svengali he portrayed himself as but he is a big a part of the story as the members make clear. Van Noy finds more success in painting a picture of each member, trying hard to spread the wealth but necessarily succumbing to giving more space to Wahlberg, who was a driving force from the very beginning and had one of the most interesting post-NKOTB careers as an actor. About halfway through the book a sinking feeling sets in that you are going to hear from every last one of those million sisters, but it’s a shrewd move. For every voice Van Noy includes, she offers the possibility for other fans to vicariously live through them as “part” of the story. Many say that the group was a rite of passage in their lives but marvel at the sorority that remains and the degree of interaction with the band. If you didn’t think NKOTB had the right stuff in the ’80s, “Five Brothers” won’t change your mind, but it does a decent job of explaining what those million sisters continue to scream about.